As we all know, Game of Thrones likes to go big in the penultimate episode of each season. 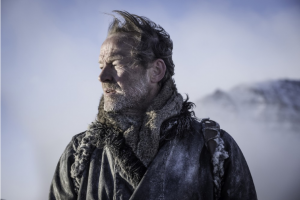 Judging by the trailer for â€œBeyond the Wall,â€ this season is no different. And the message has been telegraphed loud and clear: Winter is here. 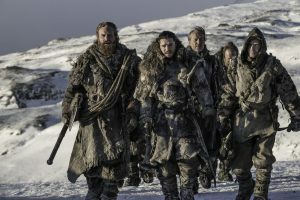 We closed last weekâ€™s episode with Jon Snow leading a motley crew of characters from all over the Game of Thrones world beyond the wall in search of a wight. The master plan is to capture one of the dead and transport it to Kingâ€™s Landing, in effort to convince Cersei of the threat to the north. 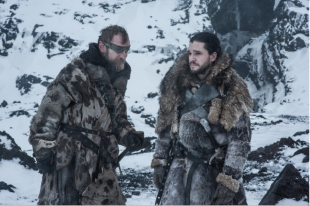 In â€œBeyond the Wall,â€ the journey actually begins, and consequently, weâ€™re in for a tense episode. In this kind of difficult expedition, the threat of danger exists around every corner. And the goal of capturing a wight will certainly guarantee a confrontation between Jonâ€™s men and the White Walkers. Blood will fall. But what we donâ€™t know is who will make it out alive. 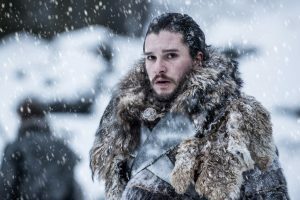 In an episode so centered around the arrival of winter, weâ€™re donâ€™t think that weâ€™ll spend too much time to the south, but weâ€™ll definitely catch up with Sansa and Arya. 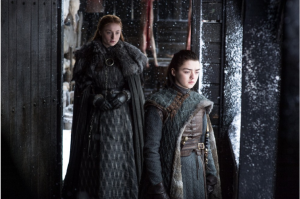 The two were having a difficult time reconnecting after their time apart, and Littlefinger preyed on Aryaâ€™s suspicious nature to further drive the sisters apart. Weâ€™ll have to wait and see how deep the repercussions go in this weekâ€™s episode. The penultimate episode of the seventh season of Game of Thrones airs tomorrow night at 9/8c on HBO.